...Four Times the Life of Standard Aluminum-Oxide Abrasives! Their performance is nothing short of amazing! The open-coat application of the particles to the rugged cloth backing resists clogging and extends disc life well beyond what you could expect from more conventional abrasives. And, as described in the test results below, the super-sharp ceramic abrasive particles cut very quickly without burning the workpieces. The 36 and 60-grit discs are provided on a super-heavy "Y" weight PSA cotton-poly backing, while all other grits feature a heavy "X" weight cotton-poly backing. We subjected these ceramic abrasive coated discs to some truly brutal tests and they came through with flying colors on all fronts! Yes, they're a bit more costly than aluminum oxide... but you can believe us when we say... They're well worth it! Order yours today and prove it to yourself under our Risk-Free, 90-Day, Money-Back Guarantee! 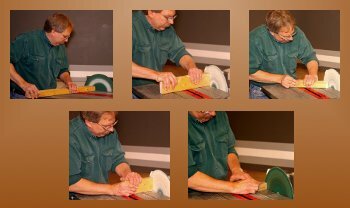 The following describes a series of six internal tests of these 12" ceramic abrasive discs, conducted by Jim McCann, Shopsmith's resident woodworking expert. All tests were conducted in-house, using a single 100-grit 12" ceramic disc on the Shopsmith Mark V - at approximately 1,600 RPM. In each of the tests above, we force-fed our workpieces into the rotating 100-grit disc as quickly as possible, until the wood was sanded down to just 4" long. The tests each required from four to eight minutes to complete... around 40 minutes for the complete series, after which our Mark V headstock was quite warm. As we completed each of the six tests, our disc was holding (but not clogged with) sanding dust. It's interesting to note that each time we switched from wood-to-wood, the sawdust from each previous wood was actually displaced by the sawdust from the new wood. This demonstrated clearly that that sawdust was, in no case, adhering tightly to the abrasive particles. When we finished the 6-test series, we simply used an abrasive cleaning stick to remove all signs of sawdust from the disk, and return it to like-new condition and color... almost as if it had never been used at all! It's also important to note that at no time was there any evidence whatsoever of workpiece burning during or after completion of these tests. This is truly amazing, considering the speed at which we forced the stock into the rotating disc. See the amazing time-lapse video of a 100-grit ceramic abrasive sanding disc reducting almost 2 feet of 2" x 4" to sawdust, then after a brief clean-up with an abrasize cleaning stick return to like-new condition.